If you are reading this, you have probably guessed my secret. I do not know what I am doing in the kitchen. That is not to say that I cannot produce some really great food (which is contained on these pages; I did not publish the boo-boos), but I lack a culinary focus. It is so easy to get bored, or think you do not really like something. Take salmon, for instance. I always thought I liked it. My husband tried to convince me otherwise. I think he was bored with it. Now, you and I both know, that is because he won’t give me control over the menu. Seriously. He is getting awfully bossy in his old age. Half the food I cook, he hasn’t even tried. That is not because he has even seen it. He thinks he knows better what to feed him. Silly, silly man. So, when I suggested this recipe, he pooh-poohed the idea. Silly, silly man. 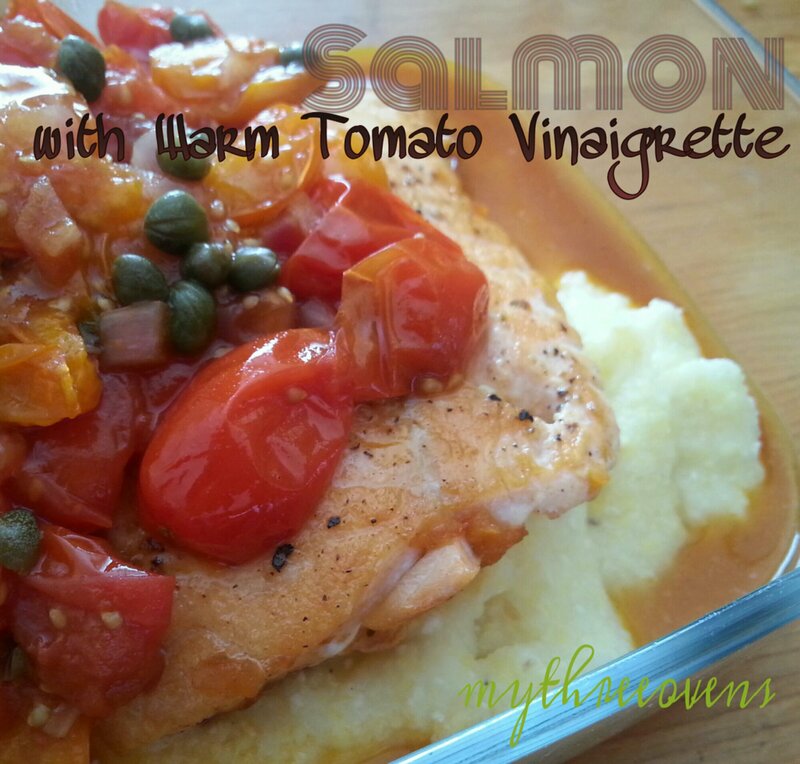 What is really great about this dish is that the salmon itself is prepared very simply, but is served with a terrific tomato vinaigrette. I buy those multi-colored grape tomatoes, even though they are relatively expensive, because they are so pretty and tasty. In the summer, which is coming soon I hope, I grow my own varied hues. In the winter, I have to buy them. Also, the directions here are for regular polenta. Personally, I buy the coarser grain from a European market. It takes much longer to cook, so when in doubt, follow your package directions. And Ferdinand? He had his salmon with salt and pepper and lemon. German potatoes on the side. He loved it, thus restoring my faith in salmon. In a saucepan, bring the water and 1/4 teaspoon of salt to a boil. Gradually stir in the polenta using a whisk or wooden spoon. Reduce the heat to low and cook until tender, thickened, and bubbly, about 12 minutes, stirring occasionally, but more often toward the end to prevent sticking. Meanwhile, in a bowl, combine the tomatoes, onion, 2 tablespoons of the oil, the vinegar, and capers. Heat a large skillet over medium high heat, add 1 tablespoon of oil. Season the fish with salt and pepper. 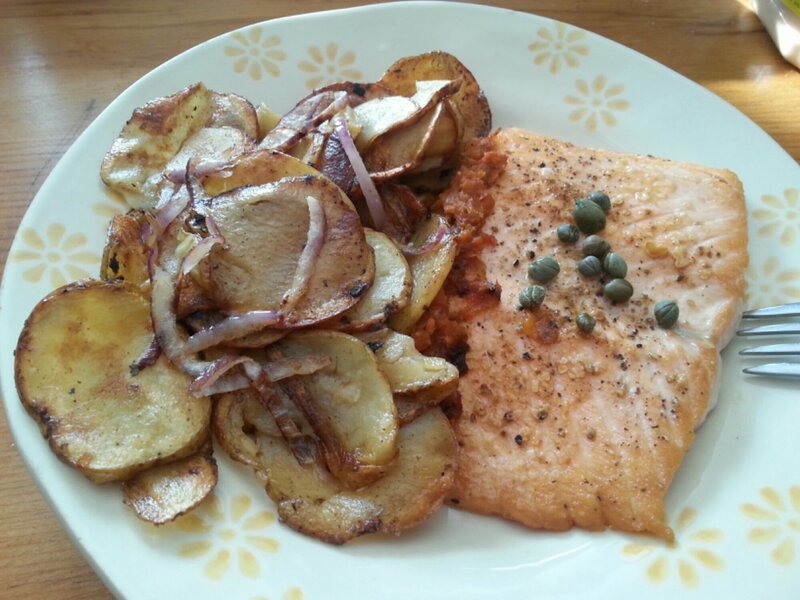 Place the salmon, skin side down, in the skillet and cook about 7 minutes. Turn and cook a minute more. Remove the salmon from the pan. Add the tomato mixture to the skillet, reduce the heat to low, and cook about 2 minutes to heat through. To serve: Spoon polenta into each of 4 shallow bowls, top with salmon fillet, tomato mixture, and garnish with chopped herb.